The best way to recruit lots of people is to stop thinking about it like you’re recruiting. 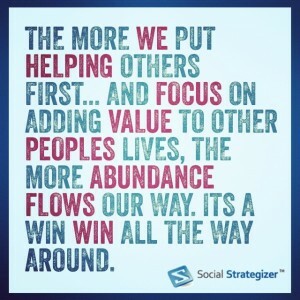 As network marketers we are in the business of helping people. I have never liked the term Recruiting. The word is associated with the military and corporate head hunters and that, to me, means people will say or do anything to get people to sign on the dotted line. In my case, with WakeUpNow, I help people save money on every day spending through Premium Local discounts and coupons. I also help people find tax deductions that save them more money through the use of our TaxBot program. The mobile app even makes their entire cell phone bill a tax write off. Yet another way I help people is with our Financial Management module that steps people through a simple acceleration process that eliminates all their debt in as little as 7 years. Including a mortgage. It’s all about helping people. If you can offer a solution to their problems and one that you believe in then people will always respond to that in a positive manner. On the other hand, if you go after people with the attitude that you are only trying to sell them something, whether they need it or not, people tend to react in a more defensive manner. Your attitude and belief level also come across in the tone of your voice and even in the content of your emails. Keep that in mind because your attitude makes all the difference in the world.